We have 'Collection Boxes' for the local Air Ambulance, Animal Care in Egypt(ACE), Mucky Paws Small Dog Rescue & Riding For The Disabled (RDA). On our Promotion Days we also sell 'Raffle Tickets' for the above Charities with some great prizes kindly donated by our Suppliers. We are delighted to announce that we are supporting - CANINE PARTNERS - a local Charity based in Osgathorpe, Leicestershire. Canine Partners is dedicated to helping transform the lives of disabled people through the use of their amazing assistance dogs. They receive no Government funding and rely solely on public donations and legacies. You can make a donation by visiting their website or to see what they do, book a place on their Information Sessions where you can see exactly what these dogs are capable of. Click here for more information about these sessions. 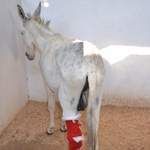 WE NOW ALSO HAVE...A 'Drop-off Bin' For ACE (Animal Care in Egypt) THEY NEED - Lead Ropes, Headcollars (pony & cob) Bits 5.5 max, any first aid items, dog and cat collars and leads, sudocrem, wormers, danilon or bute. 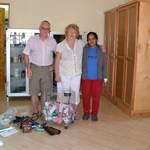 Ann Spencer regularly visits ACE so will take any donated items with her. If you would like to donate money, please visit the ACE website - see below for more details. THANK YOU. 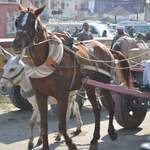 We'd like to share some interesting facts with you about these Charties and below you will see how a loyal customer and ex Riseholme livery, Ann Spencer, helps out with Animal Care in Egypt (ACE) in her spare time. For a number of years, Ann has been involved with ACE (Animal Care in Egypt), a charity dedicated to reduce the suffering of the animals in the poorest communities of Luxor by providing free veterinary care and education. Being featured on BBC South programme ‘Inside Out’ recently on 13th January 2014, ACE has been helping sick animals for almost 15 years. Incredibly, the charity treated and helped over 26,000 animals in 2012 and the Co-founder and Manager, Kim Taylor is still working really hard to train new recruits to help treat even more sick animals! Ann has recently returned from another visit to Luxor and would like to share some of her adventures and insights from that trip as well as her story of how she got involved with ACE in the first place. "I had always been interested in The Brooke charity from a young age. I loved horses and always wanted to visit the charity, so when we went to Luxor, Egypt in 2006, this was my chance to visit them. I asked one of the many caleches (horse and carriages) to take me to The Brooke and my journey began! 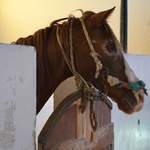 On walking inside I saw some horses being washed by their owners and in a shaded area saw a horse with terrible sores from harnesses that had been rubbing bring treated. I then turned round to see a sign which stated, Animal Care in Egypt, ACE - I wasn't at The Brooke at all! 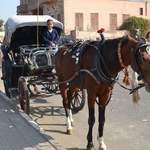 - I was in fact at another charity set up by two English women who had come to Luxor, seen the condition of the working horses and animals out there and set about improving the lives of these animals in any way they could. I walked up a couple of steps into the office, a small one you understand, nothing glamorous, just as a vet finished spaying a kitten on the office table. There was a collection box for donations, I pushed in a £20 note, and my love of the charity started there! When I arrived back in the UK I set up a direct debit to the charity for just £2 a month. Not much, and you don't miss £2 a month, yet at the end of the year I would have donated £24. Very worthwhile! My husband Phil loves Egyptology, and he is the reason we went to Luxor in the first place so he could explore the tombs and the history of the place. So another visit was put in place for the following year. ACE had a website detailing a Wish List, items they could not get in Luxor and were very useful. Items like headcollars, bits, cat and dog collars and leads, vetwrap, duct tape (there are times when vetwrap runs out they have to improvise, and this is what they use), and many more items. I set about collecting! I mentioned to Lindsay Redfern about my travels to Luxor and this fantastic charity set up by Kim Taylor and her Aunt. Lindsay listened with interest to my stories and offered a box of vetwrap as well as being a donation point for customers who wanted to support me. It didn't stop there!! Customers from Riseholme Feeds have very kindly donated bits, headcollars, fly fringes, numnahs and polypads and one lovely lady seems to buy a vetwrap or two whenever she shops! All these items travel out to Luxor with me whenever I go. Since 2006, we have caught the bug that is called Luxoritis! This means once you have been, you can fall under the spell of this country and especially Luxor itself. Sometimes we have been lucky enough to go twice in a year with our suitcases full to bursting with things they need out there. Last April a lady in Norfolk donated 4 boxes of Bute she had purchased from her vet specifically to go to ACE! There are many items they can get out in Luxor, but some are only available through supporters like myself who take them out when we go. Lindsay has always helped me to support this wonderful charity; I never have to ask, and for this and for the items donated by the customers I thank you all so much. Kim Taylor, after 10 years, still lives out in Luxor and is Manager of the Centre. 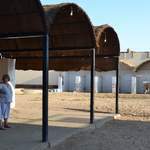 The charity has moved from its humble beginnings to a larger site, with many more stables, two paddocks, separate operating rooms for the treatment of dogs and cats, and any other animals that require care. The new building was provided by the very generous donation from one legacy that was donated. ACE is also supported by the actor Martin Clunes and his wife who, after visiting the charity, became their patron. What about The Brooke you may ask? Well, I did find them, but after visiting both charities, my vote went to ACE. I attach some recent photographs of our recent visit in December. When we arrived they were down to their very last vetwrap and all the staff came to thank us profusely for what they called 'a gift from heaven'. It was very humbling.